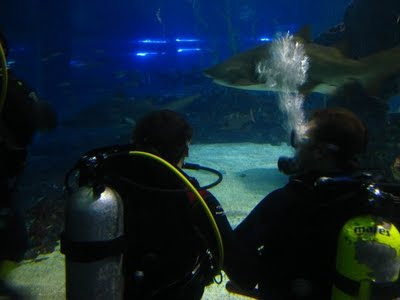 The Busan Aquarium on Heundae Beach offers shark diving a few times a month, for divers and non-divers alike. The English-speaking instructor is Michael Jones, a long-time Korean expat from Canada, who runs Scuba in Korea, a dive company based out of Seoul. Michael takes 10 divers per day, in two groups of five, on Saturday and Sunday mornings. The dive can be rather popular, so it's best to sign up at least a week in advance of the date you want to dive. You can check schedule availability here. The total program takes between 4 and 6 hours, depending on which dive group you end up in and whether or not you're certified. Non-certified divers will watch a 20-minute safety video and go through an extra 30 minute skill session. The dive itself is only 25-30 minutes; much of the program time is spent in the classroom signing paperwork and listening to a safety presentation (and MJ's oft cheesy jokes). The dive itself is pretty straightforward and efficient - MJ keeps a tight leash on his divers, and rings a bell constantly to get divers' attention and keep them moving forward in a wide loop around the pool. His vigilance is probably one contributing factor to the program's stellar safety record. MJ has taken over 1,400 divers through the shark pool without incident. The marine life of note includes a few black-tip and white tip reef sharks, some sand tiger and zebra (aka leopard) sharks, a few giant groupers, manta rays, and sea turtles. MJ has a pretty decent digital camera in an underwater housing unit that he lets divers pass around underwater to take pictures of each other, which he later posts to the Scuba in Korea website. The sharks are quite curious but surprisingly docile, and will swim comfortably within feet of divers. Even with the knowledge that over a thousand divers have come before you, it's still quite a rush to stare at a mangled mouthful of razor-sharp teeth that are swimming straight for your head. Equally curious are the Korean tourists on the other side of the aquarium pool glass, waving and taking pictures - often choosing to snap photos of the divers over the sharks themselves. The shark tank is, in my opinion, the only real reason to visit the Busan Aquarium. At 4pm daily two professional divers feed the sharks in a somewhat choreographed show, as sharks steal fish out of the divers' hands and manta rays glide belly-out along the glass window, seeming to smile at the audience before it snatches its slithery meal. 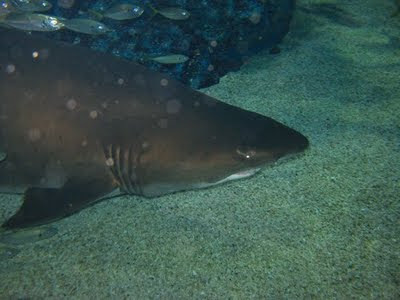 The rest of the aquarium exhibits are depressingly small, with cramped spaces for even the most active of wild animals. The sea lions' tank was devoid of any plant life or even painted decoration, and the two animals lazed motionless along the bottom of the blue tank, where the paint peeled in mockery of the animals' lassitude. 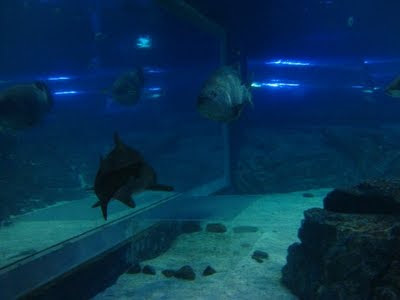 For what it's worth, though, the shark dive in the Busan Aquarium is worth it, at least once, especially for anyone who wants to get a taste of scuba diving with a little controlled thrill thrown in. 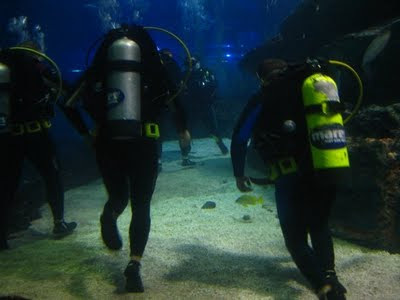 The dive costs 75,000 won for certified divers (certification card required) and 95,000 for the non-certified. Awesome! Even cooler than the condom store. yeah, i think you're right. though the condom store had condoms with sharks on them. which is kind of the same thing. you know, when i was in the galapagos we went snorkeling with sharks. er, we went snorkeling, and sharks showed up. as opposed to your thrilling and safe experience, our instructor was a raging buffoon, excourgaging us to snorkel down and provoke them. i'm highly surprised no one was killed either then or on later occasions, like when our teeny boat was tilting preciptously and upon investigation i found the whole crew chugging liquor at the wheel. anyway, congrats on your diving certification and fun underwater adventures!